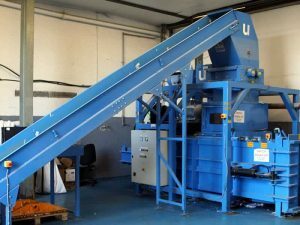 Industrial shredding machine at Let’s Talk Shred the specialist secure shredding and data destruction service in Dundee Tayside and Perthshire. Contact us for details. If you have any questions about the best way to securely destroy your confidential documents, want a quote, or to arrange a drop-off or collection, please contact us. Give us a call on 01382 725162, email us at sales@letstalkshred.co.uk, or contact us online and we’ll call you back. We are open for client drop-offs at Baird Ave, Dryburgh Industrial Estate, Dundee DD2 3TN every Wednesday from 2pm to 4.30pm. You do not need to phone ahead, just turn up. There is plenty of customer parking at our premises, so it is easy to drop off your confidential material or pick up some free sacks to take away to fill up. We look forward to seeing you.